The Saville Life: Why Easter? There is so much hoopla around Christmas and the Chriatmas story, but so often we fail in connecting the story all the way through. We fail in continuing the story to make it more, more than the birth of a Savior. Christ grew up, in both wisdom and in the ways of man. He became a wonderful teacher, healer, and disciples many. But, that was not His purpose. He had to die. Why, you ask? The sin (bad things that we say, do, or think that displease God and His standard) each and every one of us has committed creates a chasm between where we are and where God is. We cannot bring that into His presence. In fact, His justice tells us that the only punishment from our sin is death-eternally in Hell. (Complete and total separation from God). Each and every person has received his/her sentence-death, separation from God, lack of hope. But God, through his infinite wisdom and grace has supplied a way for us. Just one way! So, through a wonderfully dramatic series of events, Christ was tried, unjustly found guilty, and sentenced to death-even death on a cross. The perfect Christ, who lived a beautiful picture of His Father in heaven, who actually met the standard set by God for "perfect living" was about to die. Why? It was our redemption price. This means that He died in our stead. He literally bore the weight of every single sin we ever did or will do, was carried to a cross and died. Praise Him, the story does not end with His death. You see, His death paid for our sins, but that was it. The redemption process is not over. If He had stayed in the tomb, He would've been just as every other man. However, death could not defeat Christ; the weight of your sin (of my sin) could not defeat Christ. 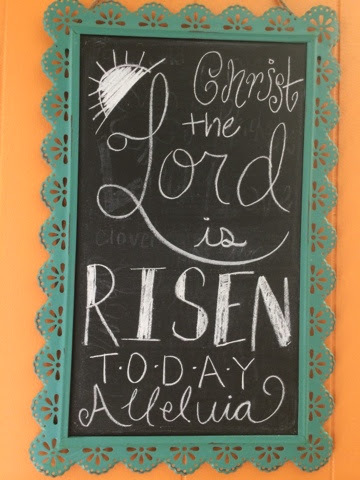 The Scripture says it best: He is not here; He is risen. Christ arose and His actions give us an escape from eternal death, from Hell, and from our sin. However, we must accept Him as Savior (one who saved us from destruction) and believe He is Lord of all. We were bought with a price, but we must accept and go along with the perfect plan. One of my favorite stories from the Old Testament is a beautiful picture of this redemption. Hosea is asked by God to go to the city and pay to purchase Gomer, a prostitute in his city. He does, and brings her home. Continually for several months, Gomer attempts to run away. She does not accept that Hosea purchased her to be free, to be loved, and to be His. She had only to accept it and she would live a beautiful life of freedom. Ultimately, after several attempts to return to her sin, Gomer believes that redemption by Hosea is the safest place to be, the best place to be. We, in this story, are Gomer. We have been bought with a price-we have only to accept that we are free, we are His--and it is th best place to be. God pursued me as Hosea pursued Gomer. I realized that I was a sinner, I had done things that were not up to par, and I did not want to spend my life in eternal death. It was better; it was right to give control to God and allow Him to rule and be The Lord of my life. So why Easter? Because He is pursuing you. He is not dead; He is Alive and wants to love you personally. You have only to accept Him and who He is!